We are accepting manuscripts concerned with various fields of bryology and/or lichenology, which are aimed at the Czech and Slovak audience, e.g. concerning the region of the Czech and Slovak Republics or of any other special interest to this region. The manuscripts should not exceed ca. 6 printed pages (longer contributions should be first consulted with the editor). They should be written in either Czech or Slovak but English or German is acceptable if the author's native language is neither Czech nor Slovak. Contributions are reviewed, the editor asks specialists to review the text and recommends eventual revisions. Name of the contribution has to be translated in English (or Czech in case of English/German texts). Informative English-written abstract and keywords are requested. English- and German-written contributions have to be provided with Czech summary (the editor will translate the summary from English/German when needed). Text of the contribution should be supplied electronically (rich text file or MS Word). Do not use excessive formatting - if possible use only italics for names of the taxa and different style(s), named Heading 1, 2... for the heading(s). Figures, tables and their captions should be positioned at the end of the file or as separate files if these are larger. Show only the numbered position of the reference in the text. Objects from other applications (graphic files, MS Excel graphs etc.) should always be sent as separate files (do not include them into the text editor), graphic files should not be saved using the lossy compression (e.g. the format *.jpg). Photographs cannot be accepted, neither in the digital form (exceptions can be granted upon contributing towards the cost of publication). For the way of literature references please consult the latest issues of the Bulletin and the following recommendations. Author names are separated by commas, intials are followed by a dot, multiple initials are separated by space. The last author is connected with the previous one by the ampersand (&). All authors are listed. Year of publication stands in round brackets, followed by a colon. The title is separated from other bibliographic data by a dash (-), all taxa names stand in italics. For sequence of bibligraphic informations in book chapters see the example below. The journal titles are given in full, books are supplied with the information about publisher and its location. The pagination is separated by a dash (-), not a hyphen (-) without space, page number in books are given in square brackets at the line end. The manuscripts are cited similarly to book titles, the location and type of the manuscript can be given in square brackets at the line end. 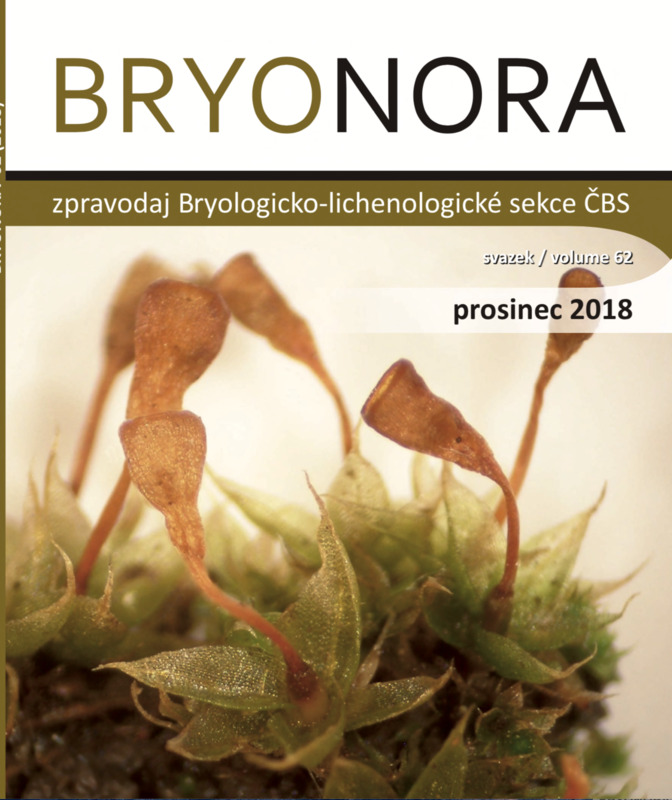 Bryonora is the journal of the Bryological and Lichenological Section of the Czech Botanical Society. We accept manuscripts concerned with various fields of bryology and lichenology which are aimed mainly at the Czech and Slovak audience. Manuscripts up to c. 15 pages in Czech, Slovak or English are accepted for the publication. Each paper is assessed by two reviewers. English-written abstract and key words are requested. Please, do not format the manuscripts into a final form – use only basic text forms like bold and italics. Figures, graphs and tables are preferentially accepted as separate files. Colored photos are welcome. TIF and JPG formats are preferred. The minimal width of graphical objects is 1400 pixels. Offprints of papers are available in PDF on this websites. Citation rules follow the last issue of Bryonora. Some essential citation rules: Author names are separated by commas, initials are followed by a dot and multiple initials are separated by space. The last author is connected with the previous one by the ampersand (&). All authors are listed. Year of publication stands in round brackets, followed by a colon. The title is separated from other bibliographic data by a dash (–), all taxa names stand in italics. The journal titles are given in full; books are supplied with the information about publisher and its location. The pagination is separated by a dash (–), not a hyphen (-), without space. The manuscripts are cited similarly to book titles, the location and type of the manuscript can be given in square brackets at the line end. Kocourková J. (2000): Lichenicolous fungi of the Czech Republic (the first commented checklist). - Acta Musei Nationalis Pragae, Ser. B, 55: 59-169. Alvarez J., Paz-Bermúdez G. & Sánchez-Biezma M. J. (2001): Estudio quimiotaxonómico del género Ramalina Ach. (Lecanorales, Ascomycotina) en Galicia (NW de Espana). - Cryptogamie, Mycologie 22: 271-287. Liška J. & Pišút I. (1995): Lišajníky. - In: Kotlaba F. (ed. ), Červená kniha ohrozených a vzácnych druhov rastlín a živočíchov SR a ČR 4. Sinice a riasy, huby, lišajníky, machorasty, p. 120-156, Príroda, Bratislava. Reviews are accepted only in Czech and Slovak.